Eric Rodgerick Wiggins, 56, a beloved son, father, brother, and friend passed away January 10, 2019, at University Hospital in Jackson, MS. Eric was born in Biloxi, MS on April 30, 1962. He is the son of Evage E. McGee and the late Arnersie Reid McGee of Biloxi, MS. He was a resident of Pascagoula, MS and worked at Ingalls Shipbuilding as an Electrician. 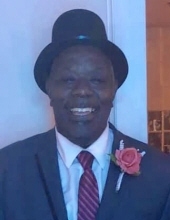 He is survived by three sons, Eric Rodgerick Smith, Rodgerick (Sheena)Wiggins of Ocean Springs, MS; Exavier Wiggins of Pascagoula, MS; two daughters, Raeven (Mitchell) Williams of Ocean Springs, MS and Ayana Williams of Gulfport, MS.
Funeral Services will be held January 19, 2019, at 11:00 am at Greater St. John A.M.E. Church, 551 Division Street, Biloxi, MS. Visitation hours are 9:00 a.m. until 11:00 a.m.
To send flowers or a remembrance gift to the family of Eric Rodgerick Wiggins, please visit our Tribute Store. "Email Address" would like to share the life celebration of Eric Rodgerick Wiggins. Click on the "link" to go to share a favorite memory or leave a condolence message for the family.